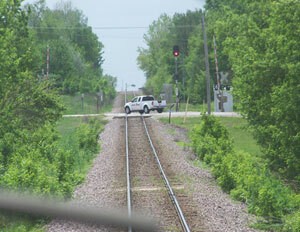 A special train is making its way across Iowa this week to promote the importance of using common sense at railroad crossings — for motorists and pedestrians. Mark Davis, spokesman for Omaha-based Union Pacific Railroad, says the effort is part of what’s known as Operation Life Saver. Davis says it’s designed to educate people about grade crossing collisions and trespasser incidents around railroad tracks, in addition to helping those who ride on the train to grasp the law enforcement and engineering sides of the program. The train rides last about 90 minutes. Davis says they’ll be steaming into several Iowa communities. Stops are planned in: Des Moines, Eagle Grove, Laurens, Fort Dodge, West Bend, Emmetsburg, Estherville and Mason City. The train will then head to Minnesota and Wisconsin. Davis says Operation Life Saver is making a difference in reducing motor vehicle crashes at rail crossings across the country. The program was started in 1972 in Idaho which was having a lot of grade crossing collisions and near misses. One year later, the number of incidents had been cut in half. The program’s since been adopted nationwide as well as in Mexico, Canada and Europe. More information on Operation Life Saver can be found at "www.oli.org" or at the Union Pacific website at www.up.com .